Hayfield is the setting for the Sunday night television series “The Village” this is the third of four videos that we have filmed in the area. Hayfield is a lovely village situated at the base of the west side of Kinder Scout in the Sett Valley between the towns of Glossop to the north, Chapel-en-le-Frith to the south and New Mills to the east. The village, in the High Peak area, was once a staging post on the pack-horse route across the Pennines from Cheshire to Yorkshire the route went up the set valley and over the watershed at Edale Cross, where the old stump of a cross still stands, and descended Jacobs Ladder into Edale. The village is now split into two by the A624 relief road which was built to ease heavy traffic that once ran through the narrow main streets. The west side of Hayfield grew with the arrival of cotton in the 19th century followed by the railway and has now extended down the Sett Valley merging with Birch Vale and New Mills. Charlesworth on the edge of the Peak District National Park and also in the High Peak area is a busy village 2 miles south west of Glossop and lies at the foot of the Monks’ Road which was used by the monks of Basingwerk Abbey in North Wales. At the top of the road is the Abbot’s Chair, the base of a monastic cross also known as the Charlesworth Cross. Monks’ Road used by the monks in the Middle Ages is the most scenic route into Charlesworth which descends very steeply down from the Glossop to Hayfield road with wonderful views of Coombes Edge and the Rocks and the valley below extending to the City of Manchester in the distance. The descent continues beyond the village to the deep valley of the River Etherow, which is crossed by a railway viaduct. The village in the 19th century was known for its Cotton Spinners and a trip to the New Mills Heritage Centre will enlighten you with the intriguing story of its past. Charlesworth has two pubs, the George and Dragon and the Grey Mare, a news agents, a post office, a shop selling fresh fruit and vegetables, a General Store near to Chisworth and a mid 19th century church of St. John the Baptist. There are also two schools the Charlesworth and Chisworth Pre-School for the 2-5 year olds and Charlesworth School (Voluntary Controlled Primary) for the 5-11 year olds. Charlesworth Lodges nestled in peaceful woodland on a hillside and well off the beaten track has spectacular views of the quarry, Coombes Rocks, on Coombes Edge. Charlesworth holds an annual carnival on its recreation ground, which includes fell races and other events. The Pennine Bridleway is a 200 mile National Trail connecting the Peak District, South Pennines, Yorkshire Dales and Cumbria and is fully signposted following a mixture of old packhorse trails, drovers roads and newly created bridleway sections travelling through stunning scenery. The new 52 mile Yorkshire Dales National Park section of the Pennine Bridleway was planned and designed specifically for horse riders, mountain bikers and walkers. The new section which opened in June 2012 stretches from Long Preston to the Fat Lamb Inn near Ravenstonedale. We park in Town Lane at the side of the road and take a look round the village before heading back up Town Lane and turn right just after the primary school at the signpost for Charlesworth Lodges. We follow the little back road uphill until we reach the end of the houses where we then follow the track between two walls still going uphill. The track levels out a bit and when we reach a tarmac track we head straight over. We pass to the left of some sheep pens to go through the gate. We now follow the grass track, the Pennine Bridleway, uphill round Coombes Edge towards the tree line in the distance. (Near the top at the road side there is a footpath sign. Just there there is a car parking area. You could start the walk from there, 2.5 miles, omitting Charlesworth.) We walk along the top of the quarry known as Coombes Rocks then continue with the tree line on our left, at the end of the tree line we go over a stile and head forward. The track bears to the right downhill with a fence on our left towards Far Coombes Farm. The fence becomes a wall and at the corner before the farm we turn right following the fence on our left. We head across the field and into the next field where we pass to the right of some ponds the nearest one being the location of Joe’s Pond used in the television series “The Village”. We head forwards and go over the stile in the corner towards a farm. At the end of the farm we go through the gate and go over the stile on the left. 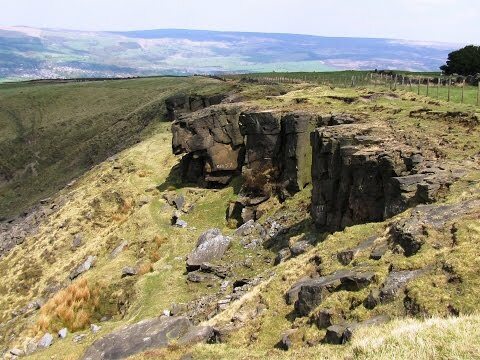 (If doing the shorter walk head forwards following the path until you reach Coombes Edge and turn right.) We now head slightly downhill through the fields making our way to the wood in front of us. We go over a stile and keep heading forwards through the wood crossing a tiny stream. We pass some holiday lodges, with a stream down below, go through a gate and follow the tarmac track until we come to the small back road at the end of the houses we started on. We follow the road back down to Town Lane at Charlesworth. This is a moderate walk on grass and stony footpaths and tracks with some moderate inclines and declines. There is also a short section of road. Approx 3.5 miles allow 1 hour 40 minutes using OS map OL1, The Peak District, Dark Peak area. Start Point: next to the George and Dragon pub. Charlesworth is near Glossop in the Peak District, Derbyshire. Travelling from the north turn off the M1 at junction 37 and take the A628 towards Manchester. After passing the first reservoir take the next left the B6105 to Glossop then take the A624 towards Hayfield and Chapel-en-le-Frith. Just past The Grouse pub on the left take the little road on the right sign posted Charlesworth. Travelling from the south turn off the M1 at junction 29 and take the A617 to Chesterfield then the A619 to Baslow and the A623 to Chapel-en-le-Frith then take the A624 towards Hayfield and Glossop. After passing Hayfield and Little Hayfield continue for about 1.5 miles and turn left on the little road sign posted Charlesworth. Parking: Plenty of road side parking. There are public toilets in Charlesworth at the back of the George and Dragon pub. For refreshments in Charlesworth’s centre there is Charlesworth Village News Agents, a post office, a shop and two pubs the Grey Mare and the George and Dragon. Outside the centre towards Chisworth there is a General Store. There are more public toilets, shops and pubs in nearby Glossop, Hayfield and New Mills.